Born in Salford and raised on romance, The Lottery Winners can be found at the exact midpoint between the North West’s dual musical Meccas. Manchester and Liverpool have claimed many a legendary artist as their own, but more often than not they hailed from somewhere betwixt the two. Somewhere beneath Blake’s ‘dark satanic mills’, somewhere called Leigh, the birthplace of Georgie Fame and the Buzzcocks’ Pete Shelley. Its 2016 and Lancashire has done it again, spawning the best live band to emerge from the North West in a generation. Set to be a recurrent name in the lists of bands to watch in 2017, The Lottery Winners’ brilliantly buoyant indie pop tunes are being set to record by superstar producer Danton Supple (Coldplay/Norma Jean Martine/Morrissey), and will be bursting into glorious life on Valentines' Day. The recording is being overseen by Seymour Stein, the US A&R legend responsible for the careers of Madonna, Talking Heads and the Ramones as well as local heroes Echo & The Bunnymen and The Smiths. Good company to be sharing. The band were signed right after a storming ship board performance at Liverpool’s Sound City festival. Immediate reactions like that are common for The Lottery Winners. They’re not just a band you like, they’re a band you LOVE. 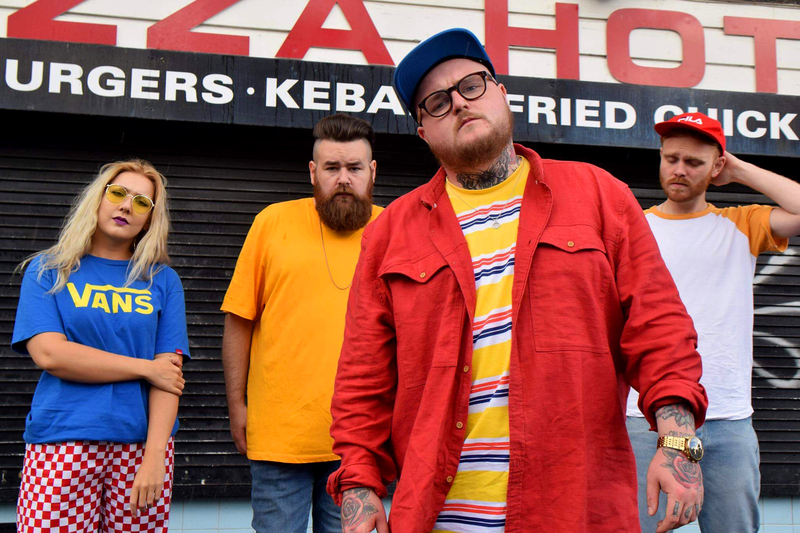 Fans have already shown their love when, wanting to raise money to buy a van to go on tour, The Lottery Winners completely smashed a Pledge Music campaign, hitting the target within three days. Three days! A Pledge Music record. Van bought, The Lottery Winners set off down the A579 and didn't come back 'til they had won over the audiences of bands like Clean Cut Kid, Catfish And The Bottlemen, Madness, Circa Waves, Rat Boy, Pete Doherty, Blossoms, Paul Heaton & Jacqui Abbott, Everything Everything, The Coral, Spring King, The View, The Charlatans, The Wonderstuff and The Wedding Present; at shows from Brighton to Arbroath. A celebratory homecoming World Tour of Lancashire sold out, even the legendary Phoenix Club from Peter Kay’s Pheonix Nights. 11,000 new Facebook friends and a van-full of empty merch boxes was an outstanding haul. Then came radio. Three songs the band uploaded to BBC Introducing are getting traction across the BBC networks as well as Radio X, Amazing Radio and the reborn Virgin Radio. The blogosphere has taken the band to heart, spreading the love for the incredibly creative videos for Elizabeth, I Know and Young Love (see ‘Quotes’ page attached). Three videos made for less than it cost to tax the van have now been viewed over 200,000 times. You can’t buy personality and fans know authenticity when they find it.